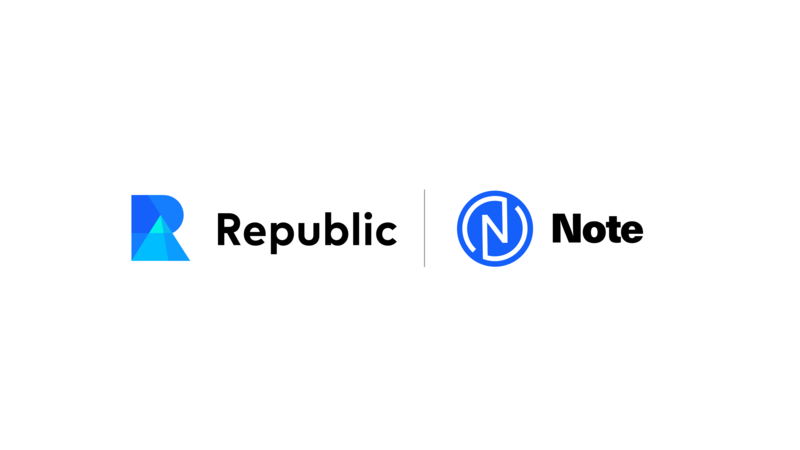 We’re launching the Note today — a digital asset earned for growing our startup ecosystem — to create an even more symbiotic relationship between founders and investors on Republic. Today, Note holders get access to a growing list of on and off-platform perks, like reserved allocations into our hottest deals and exclusive event tickets. We aim to connect the Note to our economic stake in all the startups that have and will raise on Republic, and by extension, our future income. This feature is a work in progress and not guaranteed, but existing Note holders will be the first to know (and benefit). You can earn Notes at a significant bonus until April 16th, 2019: with a 2x multiplier on completing Bounties, and 10 Notes for every friend you refer. This is a one-time offer. This post and our Note homepage are the most comprehensive sources of answers to any questions you may have about the Note. Talent is evenly distributed — opportunity is not. We launched Republic in 2016 inspired by this adage, and since then, a lot has changed. Since our launch, more than 100 founders have successfully raised capital to grow their businesses and create new jobs, from blockchain projects like PROPS to barbershop software like theCut. Over 25% of these startups were venture-backed at the time of their Republic campaign, and many have raised further funding at a premium. This entrepreneurial movement is made possible by over 100,000 investors of all backgrounds, deploying as little as $10 to $75,000 towards Republic-curated projects. While these investors diversify their portfolios into the next startup success stories, they’re also diversifying the talent pool: over 50% of all capital raised on Republic funded female and minority founders. We’re proud of our progress to connect the masses with ambitious startups deals, while helping founders build the future. Public adoption of startup investing helps everyone profit from progress — but how quickly it happens starts with you, and it’ll take everyone. That’s why today, we’re introducing a simple blockchain-powered token to reward millions of present and future Republic users for every action they take towards our common mission: to help everyone participate in creating the future, and to let them benefit from its success. Meet the Note — a new digital asset earned for growing the startup ecosystem. 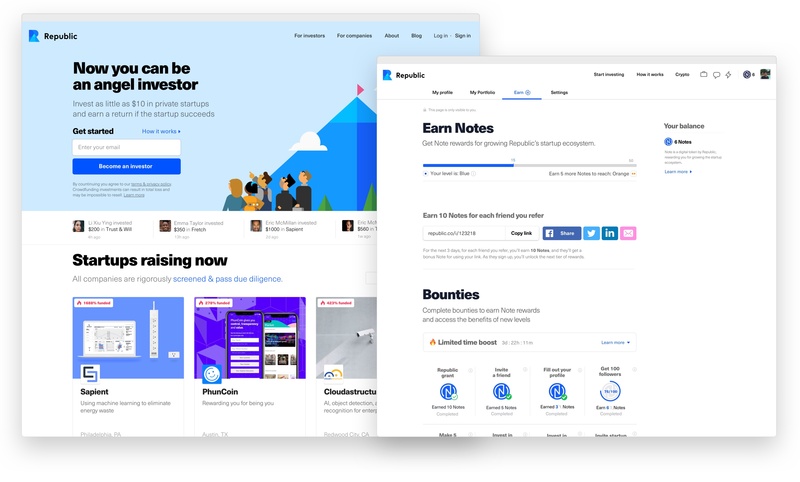 Note holders get access to exclusive perks that improve the Republic experience on and off-platform, and eventually, they may be eligible for a share of our revenue. Below is everything you need to know to claim your cut the Note pool we’re giving away. Share in our portfolio: We aim to connect the Note to Republic’s economic rights in all the startups that have and will raise on our platform, and by extension, our future income. This feature remains a work in progress and is not guaranteed, but existing Note holders will be the first to know — and benefit. The Note is sweat equity: You’ll get Note rewards for helping startups (including Republic) grow, without the need to make a financial commitment. Best of all, you’ll earn Note rewards immediately - not over the many years a traditional startup takes to reach a liquidity event. The Note is our way of thanking Republic’s earliest believers — especially our community of investors and partners. It is our hope to mobilize millions more to back and support founders on Republic, and the Note plays an important role in rewarding new investments and aligning incentives between founders and backers. So today, to celebrate our launch, we’re offering two earning boosts we never plan to run again: earn 10 Notes and give your friend a boost for every signup you refer, and enjoy 2x earnings on all Bounties — that is, on-platform activities with Note rewards — for a limited time until April 16, 2019. Start earning right now, or keep reading to learn everything there is to know about the Note. OK — so what is the Note? The Note is a digital asset that’s earned and stored on Republic. You can’t sell Notes on a crypto exchange or otherwise move them off the platform - they’re just not liquid, though we hope to change that. Think of Notes as “startup loyalty points” used to unlock perks both on and off the Republic platform — except unlike frequent flyer miles or loyalty programs, the Note is the technical and legal foundation for something much greater. More on that later. Here’s what it’s not: It’s not a security, it’s not a utility token, it’s not equity and it does not represent any claim to earnings, profit, or assets. What is the Note worth? The Note currently holds no monetary value and does not represent any asset nor claim to revenue. That said, if we’re successful in backing the Note with some form of value, the answer to this question stands to change - especially if the value is a share in our ever-growing startup portfolio. Ultimately, though the Note cannot be traded at this time, it’ll be worth whatever the market will want to pay for it — the Note is subject to the classic rule of pricing set by supply and demand. What is the total Note supply? Our current token pool is 20 million Notes — though we plan to share more details on our total pool and economic model this summer. 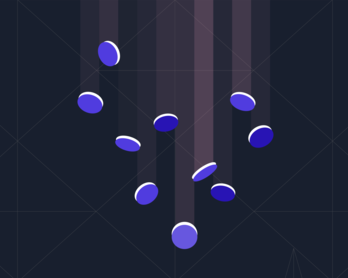 Once all Notes are distributed, the only way to get Notes will be from other Note holders — by which point, we plan for the Note to be tradable, though that’s not guaranteed. Why did you create the Note, and why are you giving it away? We think the Note will support our mission to get more people building, investing, and benefiting from the success of the future. First, it’ll be by attracting them to check what Republic has to offer to founders and investors. Republic is better the larger our pool of founders and investors, so our token giveaway if primarily designed to attract both sides of the market and give them a chance at bat. Next, we want to reward our most active investors by giving them more chances to be helpful: by giving extremely engaged investors priority access to deals we hope not to be exclusive, but to give founders the privilege of working with the most hands-on investors we know — which they love. Last, we eventually want to give founders the chance to use the Note and our lessons launching it to benefit their own campaigns - but this step is still a long way off. Your Notes live in your Note wallet on Republic. While you may one day be able to move Notes between wallets, there’s currently no way to move the Notes off the Republic platform. “Coming soon?” Why isn’t the Note shipping with a tie to the value of the Republic portfolio today? Launching an asset backed security tied to our earnings is no small feat. First, developing a token backed by our expected earnings is a tremendous and novel technical, regulatory, and economic project — for better and worse, we’re really trailblazing this type of blockchain implementation. Next, launching a finance product is risky to Republic's current business and users from a financial and compliance perspective. For these reasons and more, we believe this Note launch will teach us a lot about how people like you earn, use, and talk about your Notes. This, alongside the work of the best economic, legal, and technical minds, should give us everything we need to make great decisions towards developing a truly rewarding Note. Have feedback for us already? Let us know in the comments! What benefits does the Note offer? For now, the Note’s levels —from Gray to White — represent various types of access to events, investment opportunities, and our network. More perks will be added over time, but for a full and updated list of benefits, see your Earn page. You’ll earn Notes every time you invest in an active Republic campaign, refer a friend to join Republic, introduce a startup that runs a campaign of their own — and more. We call on-platform activities that earn Note rewards Bounties — and you can see them all on the Earn page here (requires login). For a short time, you’ll earn 10 Notes for every friend you refer to sign up, and all Bounties will pay out increased rewards during our launch campaign. Ok, but how do I earn as many Notes as possible?! That’s the attitude! To maximize your Note earnings, you’ll want to try to complete as many Bounties as you can during the short 2x earnings boost period — and to really power up your earnings, refer your friends to sign up. The limited time 10 Note referral bonus remains one of the best ways to earn Notes and quickly move up the ranks. Find your referral link and a list of all available Bounties on the Earn page. You receive Notes into your Republic wallet as soon as you earn them — though you’ll need to confirm your email address before you’ll be able to claim them. Certain bounties are subject to a planned delay, such as Notes earned for investing in a Republic campaign, which are disbursed soon after the campaign ends successfully. I thought crypto was over. Why launch a token now? The crypto hysteria is finally over, yes - but thankfully, the last boom/bust cycle still left us with substantial public awareness of cryptocurrency. We see an opportunity for the Note to create immediate benefits today (ie increased engagement between founders & investors), but also chart a path towards creating significant long-term value financially and technically. Today is Day 0 of a long-term bet on asset tokenization - from land and major brands today, to entire investment portfolios and even returns of individual companies. I’ve never used crypto — what do I need to know? Right now, not much — just what it is and where it’s stored (a digital asset that lives only on Republic), and that it’s a few technical and legal abstractions from being a fully fledged cryptocurrency. It’s our plan to develop the Note into an ingenious but approachable crypto product, but until then, if you understand frequent flyer miles, you’ll have a fairly intuitive grasp on the Note. Can I make money selling the Note? No, the Note is currently illiquid, and exists only your the Republic wallet — though we’re working on plans that may change that. There’s currently no way to trade or sell the Notes, and it has no economic value. Is the Note a utility token? No. Because the Note remains under Republic’s custody on the platform, thus can’t be traded, and has no economic value, we do not believe the Note to be a security token or a utility token. Though the token offers practical benefits, like a better investor experience on Republic, we consider these on par with “loyalty points,” not a true utility token. All this may change if we’re able to find a compliant and technically sound avenue to connect the Note to our present and future portfolio of startups, but there’s no guarantee. Which blockchain or platform is the token launching on? The Note is not yet connected to a public mainnet. We’re considering industry-leading solutions to formally deploy the Note on a blockchain, including our partners at Stellar and Binance. When do you expect to link the Note to a network, and let me take custody of it? We expect to link the Note to a blockchain in 2019, which should allow you to claim custody of your Notes. Will I need to complete Know Your Customer (KYC) or Anti-Money Laundering (AML) checks to claim my Notes? As Notes are not securities, do not trade, and offer no claim to any economic value, the current answer is no, you will not need to complete KYC or AML. You will, however, need to confirm your email to claim your Notes. Should Republic successfully transition the Note we’re launching today into an asset-backed token, it’s possible the Note may be recognized as a security, at which point it will be necessary for you to complete KYC and/or AML in order to take custody of your Notes and move them off the Republic wallet. Our terms of service don't allow an individual to use multiple accounts to claim bonus Note rewards — but should someone hypothetically accrue many accounts with large Note pools, the requirements of KYC/AML would make it impossible for them to withdraw their new asset-backed notes. In short, don't waste your time. Will I have to pay taxes on Notes I earn? The Note currently does not represent an asset nor claim to earnings, you are not buying nor selling it, and it has no inherent economic value - so no, you will not be responsible for any taxes on Notes you earn today. In the future, if and when the Note is converted into a security, Note holders who actively claim the conversion would be responsible for long term or short term capital gains, dependent on how long they've held a Note before liquidating it. Dividends paid out through the Note — if they ever happy — would be taxed as income. Did we miss your question? Let us know in the comments below and we'll credit you if we add it to our list above. Disclaimer: Although the Note may not at this time constitute a “security” under our view of applicable laws and regulations, Republic is conforming to the standards of testing the waters under Regulation A of the Securities Act of 1933, as amended (“the Act”). This process allows companies to determine whether there may be interest in an eventual offering of its securities. Republic is not under any obligation to make an offering under Regulation A. Republic may choose to make an offering to some, but not all, of the people who indicate an interest in investing, and that offering may not be made under Regulation A. For example, Republic may determine to proceed with an offering under Rule 506(c) of Regulation D, in which case we will only offer our securities to accredited investors as defined by Rule 501(a) of Regulation D.
If and when Republic conducts an offering under Regulation A, it will do so only once (i) it has filed an offering statement with the Securities and Exchange Commission (“SEC”), (ii) the SEC has qualified such offering statement and (iii) investors have subscribed to the offering in the manner provided for in the offering statement. The information in the offering statement will be more complete than the test-the-waters materials and could differ in important ways. You must read the offering statement filed and qualified with the SEC. No money or other consideration is being solicited for our Regulation A+ offering at this time and if sent in to Republic will not be accepted. No offer to buy securities in a Regulation A+ offering of Republic can be accepted and no part of the purchase price can be received until Republic offering statement is qualified with the SEC. Any such offer to buy securities may be withdrawn or revoked, without obligation or commitment of any kind, at any time before notice of its acceptance given after the qualification date. Any indications of interest in Republic offering involves no obligation or commitment of any kind. What is interest (%) in my in investment? In regards to the note color tiers, is there a set list of perks that is available for each tier or is that yet to be determined? What an interesting development! I literally received a ton of Notes recently. It was also great that I didn't have to try to fumble around setting up a crypto wallet off site. Thanks, Republic! Let's see where it all goes together! Tremendous step in the direction of broad business tokenization - and a great signal that Republic is leading by example. As I understand it, Republic is currently the designed of Bounties to earn Notes, and the only distributor of Notes. Is there any plan to allow companies raising on Republic to design their own incentives and issue their own Note rewards? And is there anyone who'd use such a feature here? 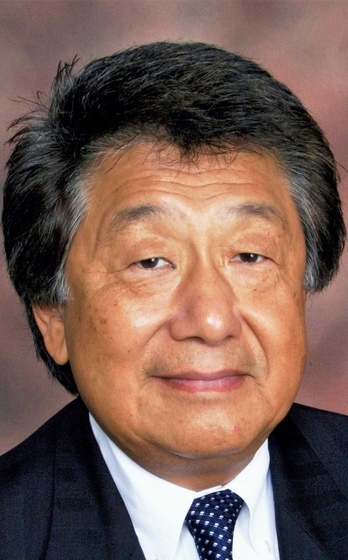 PETER JUNOT @michael-gasiorek Do you think Investor are stupid enough to accept note instead of stake. Peter Green @peter-junot we're not suggesting the Note would be a substitute of anything ? it could be an additional incentive. Republic's core model doesn't change. Here, something of great value has been created, just as Republic itself is very valuable. Huge success for note, the idea and implementation is just great. Peter Green @katrin-brockmuller Thank you for your support, Katrin! Great move, Republic, very exciting to see tokenomics implemented on the very platform that supports crypto fundraising! Question: how about legacy, will we receive Notes for previously referred people and companies? Peter Green @alex-fedosseev thank you for your support! Yes, our existing users have received grants for investing, referring, and even simply for being an early user when Republic first launched in July 2016. Yves Cuyugan @peter-green just curious on when are we going to see the tokens on our accounts for previously invested companies? Baron Huntington @peter-green I have a few investments that haven't finalized and they won't be before the bonus ends. . Will the 3x bonus apply to them? Peter Green @baron-huntington if they were made (or increased) during the 3x, they will get the 3x reward! @yves-cuyugan only investments made after 4/4/2019 (the private launch of the Note) will count towards bounties, however all previous investors have received grants. I will follow up with you directly on how to get yours if you haven't gotten one. I have added a payment option in my profile, but have not received any credit for same. When will I receive credit for this action? 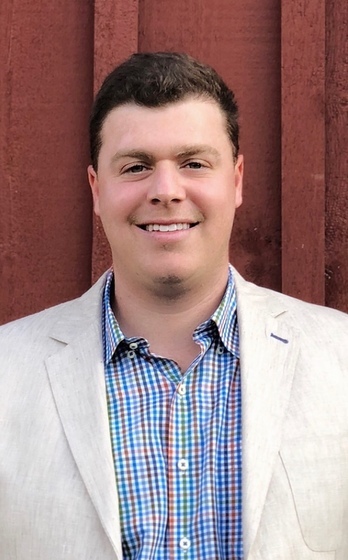 Peter Green @john-tedor Hi John, most likely because you've already had a payment method added in the past, prior to the launch of the Note and the Bounty system. Different users can see different bounties available ? check back for more coming soon! What are hidden bounties and how do they work? How exactly does one find or complete a "Hidden Bounty"? Baron Huntington @peter-green I have 2/50 towards a hidden bounty. I have been doing more active the past few days, but I'm not making any progress. I'm an active investor. I interact with Founders but I'm not earning anymore Notes. Peter Green @baron-huntington they are meant to be surprise/unpredictable, so unfortunately I can not disclose any more details. We are very grateful to have you on Republic and thank you for being a part of our journey from the very beginning! Baron Huntington @peter-green I just had 20 tokens disappear and I 18/50 towards a hidden bounty taken away today and 2/50 yesterday. Peter Green @baron-huntington please re-check now, there has been a recounting of the Notes today. Please note that for referring users, you will only receive Notes once the new users confirm their email addresses. Thank you! Baron Huntington @peter-green Does the unpredictability of the hidden bounties include the progress disappearing? Two times I was earning my way towards a hidden bounty and it disappeared. Peter Green @baron-huntington hey Baron ? sorry, it was actually a temporary bug and the progress wasn't supposed to be visible on the hidden bounties, as it defeats the purpose. It's now prevented from showing, as designed, but your progress certainly didn't change. This is a very clever move from Republic! Very excited about it! Baron Huntington @bruno-rocha I hope that Republic will reward investors when companies exit. It's not guaranteed.